Normally exclusive to the Swiss market, only 100 of these hand crafted humidors exist in the world. 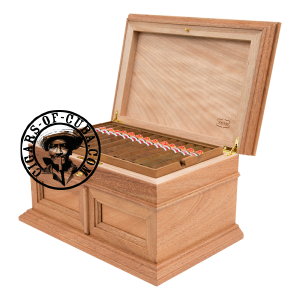 Equiped Adorini Cigar Heaven humidifier, this beatiful humidor contains 50 cigars made from only the best tabacco from the Vuelta Abajo region of Cuba. Beatiful and rare, this humidor is guaranteed to become a major collectors peice.